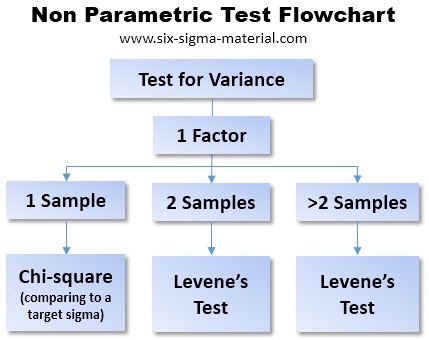 In general, the power of parametric tests are greater than the power of the alternative nonparametric test. As the sample size increases and becomes larger, the power of the nonparametric test approaches it parametric alternative. Nonparametric test also assume that the underlying distributions are symmetric by not necessarily normal. 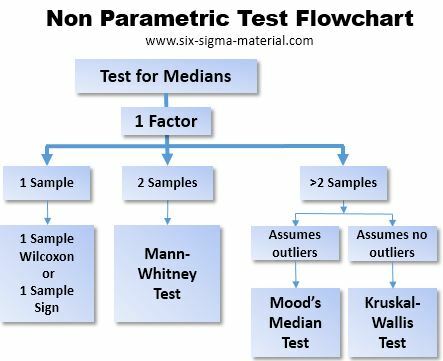 When the choice exist on whether to use the parametric or nonparametric test, if the distribution is fairly symmetric, the standard parametric test are better choices than the nonparametric alternatives. For example, if you are not sure if two data sets are normally distributed it may be safer to substitute the Mann-Whitney test to reduce the risk of drawing a wrong conclusion when testing two means. Data can not be assumed to meet normality assumptions and can not be practically transformed to approximate normality. With qualitative data of nominal scale or ranked data of ordinal scale. When comparing Median values for skewed data (such as right or left skewed data). See Histograms for more insight on skewed data. When there are very few, if any, assumptions regarding the shape of the distribution. However, if there is a bi-modal distribution, the data should be reviewed and separated to correctly analyze the true process performance. Don't be forceful or careless and rush into a nonparametric test when there is clearly two (or more) unique situations in within the data. Use the Runs Test to verify the nonnormality is related to random causes and not a results of special causes. Attempt to transform the data such as through a Box-Cox transformation.